Egyptians are currently following the selection of a new Coptic Orthodox Pope to succeed the late Pope Shenouda III, who led the church for 40 years. The selection process began immediately after Shenouda's death in March, after which 76-year-old Bishop Pachomios was appointed interim pope by the church's Holy Synod. In the immediate wake of Pachomios' appointment, the church drew up a committee mandated with drawing up a shortlist of nominees to become Shenouda's successor. Another committee was also tasked with choosing electors – those members of the Coptic community who would have the right to cast ballots in the papal electoral process. A total of 2,406 electors were chosen, drawn from among Coptic archbishops, bishops, lay council members and agents of the archdioceses, as well as prominent Coptic laymen including Coptic newspaper editors-in-chief and members of the Egyptian Journalists' Syndicate. In line with church regulations, all electors are above the age of 35. The Ethiopian Churchwas also allowed to dispatch five of its own electors. The move comes in line with 1957 Coptic Church bylaws stating that the Ethiopian Church – which formally separated from Egypt's Coptic Church in 1959 – should have a say in the selection of the Coptic patriarch. 1. Father Pachomios El-Syrian: A monk at the El-Syrian Monastery (dedicated to the Virgin Mary) in Wadi Natrun, a valley situated in Egypt's Nitrian Desert. Born in Aswan, Upper Egypt, in 1963, he holds a joint degree in science and education. Father Pachomios currently resides in Italy. 2. Bishop Raphael: Auxiliary bishop of central Cairo and the capital's Heliopolis district, a former aide to the late Pope Shenouda III and a member of the Coptic Church's Holy Synod. Born in Cairo in 1954 and a graduate of Ain Shams University's medical faculty, Raphael was ordained bishop in June 1997. 3. Father Raphael Ava Mina: A monk at St Mina Monastery (Mar Mina), located in the Western Desert near the coastal town of Alexandria. Born in Cairo in 1942, Raphael has a law degree from Ain Shams University. 4. Father Seraphim El-Syrian: Also a monk at the El-Syrian Monastery. Born in 1959 in Cairo, Seraphim holds a science degree from Ain Shams University. He lives in the US. 5. Bishop Tawadros: Auxiliary bishop for the northern Beheira governorate, and auxiliary to Bishop Pachomios (who is currently serving as acting pope). A member of the Holy Synod, the Coptic Church's highest authority, Tawadros was born in 1952 and studied pharmaceutical sciences at Alexandria University. He was ordained bishop in 1997. On Monday, 29 October the five candidates will enter the penultimate stage of the papal election, when the electors – who are allowed to choose up to three nominees – will choose three finalists from among them. These three will go on to run in the final phase of the electoral process: the 'alter lottery' on 4 November, in which a blindfolded child will randomly select the name of the church's next pope. According to regulations spelt out by church authorities, candidates – who are not viewed as rivals per se – will not do any kind of electoral campaigning in advance of the vote. Rather, electors have simply been provided with brief bios of each of the five finalists, upon which they will presumably base their choices. The election will be held from 9am to 5pm Monday in Cairo's prominent Coptic Orthodox cathedral in Abbasiya. Latecomers will not be allowed to cast ballots. The counting process will begin immediately after polling ends, and vote results are expected to be announced around 9pm the same day. An interior ministry representative has been tasked with attending the vote as it takes place. After the polling, he is expected to sign off on the final results, copies of which he will then hand over to both the ministry and church officials. Two of eight glass ballot boxes, meanwhile, have been reserved for electors that live abroad. These can either come to Egypt to cast their ballots themselves or assign Egypt-based proxies to do it for them by obtaining legal authorisation from their respective embassies. The papal elections, however, do not come without some controversy. 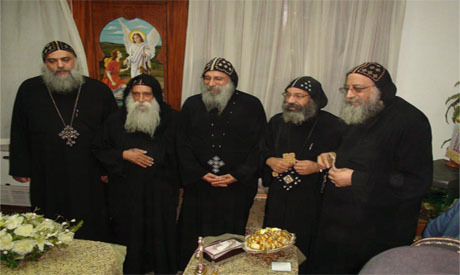 For one, the church's Holy Synod, under interim pope Pachomios' leadership, has decreed that the election process take place according to the terms of 1957 church bylaws – which are themselves the source of considerable disagreement within the Coptic community. Critics of the system currently in use point out that only members of Egypt's press syndicate can be chosen as electors. For years, they have called for the papal electorate to bewidened to include Coptic laypeople of other professions, such as doctors, lawyers and engineers.Critics would also like to see all Coptic priests given a vote, which is not currently the case. The interim pope, for his part, has argued that the bylaws cannot be modified in the absence of a sitting parliament. The People's Assembly, the lower house of Egypt's parliament, was dissolved this summer on order of the country's then-ruling Supreme Council of the Armed Forces and will only be reinstated following legislative polls slated for sometime next year. The bylaws in question have proven so controversial, in fact, Pachomios has reportedly asked all papal nominees to provide written guarantees that they would work on amending the controversial regulations within the first year of their assumption of the papacy. The 'alter lottery,' the final phase of the election process (slated for 4 November), is likewise the subject of some debate among church congregants. Many would like to see the practice, which involves a blindfolded child drawing the winner's name at random, abolished. They say that the system – which is also enshrined in the 1957 bylaws – has no spiritual or legal basis, having been employed only ten times since first having been introduced in the eighth century. The late pope Shenouda III, along with his immediate predecessor, Cyril VI, were both elected to the papacy by way of this system. Egypt's 118th Coptic Pope, say informed observers, can expect to face a number of major challenges. According to Coptic Bishop Markos of Cairo's Shubra el-Kheima diocese, the biggest challenge facing the new pope will be his ability to live up to his predecessor's towering reputation. "The church needs the pope to be a spiritual man, as well as an administrator able to deal with everyone and reach out to everyone – both to those who voted for him and those who did not; both to Christians and non-Christians alike," Bishop Markos told Ahram Online. Youssef Sidhom, member of the church's lay council and editor-in-chief of Coptic weekly Watany, said the new pope "must be able to deal wisely with government institutions, Egypt's varied political and religious trends, and with other Christian churches." Coptic Bishop Rafael of Central Cairo and Heliopolis, one of the papal finalists, for his part, said the new pope must devote himself to reorganising the church from within; set specific rules for the promotion of monks and priests; make an effort to draw alienated Coptic youth back to the church; and reinvigorate church services by preparing servants from the laity capable of keeping abreast with technological innovations. With all the challenges that face Egypt, I hope the new Pope will provide the needed wisdom for better dialog and keep the internal affairs be resolved internally. I also like the alter lottery system. I think we should use it in our national elections. It would save the country large sum of needed resources. Anyhow, nice photo AO.